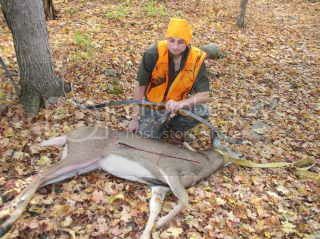 Congrats nova on your nice PA deer. What is a BB buck? Bare bow? Button buck? Sounds like you made a great shot. Do you practice shooting at moving targets? How? Rolling a wheeled target down a hill? I can't imagine shooting at a moving deer and I wouldn't recommend it. Chisler, It was a button buck, I dont recomend shooting at running deer to anyone not comfortable doing it or any shot they dont have confidence in. I never no if im going to shoot till the moument I have to , many times I pass on game standing broadside that are close cause for some reason the shot dont feel right. I do pratice on moving targets, and have taken some game that have been on the move.